Vạch rõ âm mưu đằng sau cái gọi là LHQ-21 PHÁT TRIỂN VỮNG BỀN: độc quyền cai trị của Trật Tự Mới cho Thế Giới. Have you wondered where these terms ‘sustainability’ and ‘smart growth’ and ‘high density urban mixed use development’ came from? Doesn’t it seem like about 10 years ago you’d never heard of them and now everything seems to include these concepts? Is that just a coincidence? That every town and county and state and nation in the world would be changing their land use/planning codes and government policies to align themselves with…what? First, before I get going, I want to say that yes, I know it’s a small world and it takes a village and we’re all one planet etc. I also know that we have a government of the people, by the people, and for the people, and that as cumbersome as that can be sometimes (Donald Rumsfeld said that the Chinese have it easy; they don’t have to ask their people if they agree. And Bush Junior said that it would be great to have a dictator as long as he was the dictator), we have a three branch government and the Bill of Rights, Constitution, and self-determination. This is one of the reasons why people want to come to the US, right? We don’t have Tiananmen Square here, generally speaking (yes, I remember Kent State–not the same, and yes, an outrage.) So I’m not against making certain issues a priority, such as mindful energy use, alternative energy sponsorship, recycling/reuse, and sensitivity to all living creatures. Considering its policies are woven into all the General Plans of the cities and counties, it’s important for people to know where these policies are coming from. While many people support the United Nations for its peacemaking efforts, hardly anyone knows that they have very specific land use policies that they would like to see implemented in every city, county, state and nation. The specific plan is called United Nations Agenda 21 Sustainable Development, which has its basis in Communitarianism. By now, most Americans have heard of sustainable development but are largely unaware of Agenda 21. Agenda 21 policies date back to the 70’s but it got its real start in 1992 at the Earth Summit in Rio de Janeiro when President Bush signed onto it. President Clinton signed it later and continued the program in the United States. 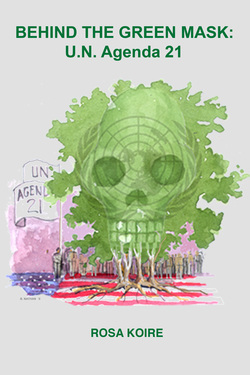 A non-governmental organization called the International Council of Local Environmental Initiatives, ICLEI, is tasked with carrying out the goals of Agenda 21. Over 600 cities in the U.S. are members; our town joined in 2007. The costs are paid by taxpayers. No matter where you live, I’ll bet that there have been hundreds of condos built in the center of your town recently. Over the last ten years there has been a ‘planning revolution’ across the US. Your commercial, industrial, and multi-residential land was rezoned to ‘mixed use.’ Nearly everything that got approvals for development was designed the same way: ground floor retail with two stories of residential above. Mixed use. Very hard to finance for construction, and very hard to manage since it has to have a high density of people in order to justify the retail. A lot of it is empty and most of the ground floor retail is empty too. High bankruptcy rate. So what? Most of your towns provided funding and/or infrastructure development for these private projects. They used Redevelopment Agency funds. Your money. Specifically, your property taxes. Notice how there’s very little money in your General Funds now, and most of that is going to pay Police and Fire? Your street lights are off, your parks are shaggy, your roads are pot-holed, your hospitals are closing. The money that should be used for these things is diverted into the Redevelopment Agency. It’s the only agency in government that can float a bond without a vote of the people. And they did that, and now you’re paying off those bonds for the next 45 years with your property taxes. Did you know that? And by the way, even if Redevelopment is ended, as in California, they still have to pay off existing debt–for 30 to 45 years. All of this sounds unbelievable until you have had direct experience with it. You probably have, but unless you resisted it you won’t know it’s happening. That’s why we’d like you to read our blog ‘The Way We See It’ (click here). Go to the section in the blog (look on the right side under Categories) called Our Story. You’ll get a look at how two unsuspecting people fell into a snake pit and survived to tell about it. Previous Previous post: Không bỏ phiếu cho ÁC QỦY !! !